Posted on March 5, 2016 at 12:19 pm. Making sure that water continues to flow irrespective of population growth, increases in tourism numbers and other seasonal demands, requires a large infrastructure, sophisticated technology, and a dedicated organisation behind it. The Water Services Corporation (WSC) in Malta has evolved over the past two decades into a modern corporation adopting innovative technological solutions and sophisticated technology that has helped deliver the best-quality service to our customers. One way is by using geographic information system (GIS) based applications. 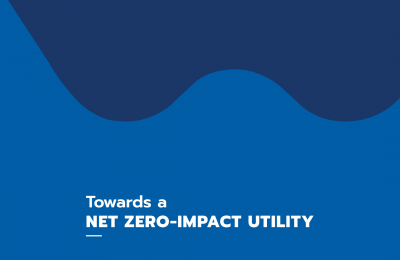 Adopting this “spatial” strategy has enabled the WSC to determine how our core business can exploit location data to improve decision-making, reduce risks, and optimise operations. The WSC is, as far as is known, the first large local organisation to adopt GIS to manage, control, and plan internal projects. Over the years the corporation has built up a very comprehensive GIS capacity that includes the geo located points of all water meters, valves, taps, and pipes that exist on the Islands. 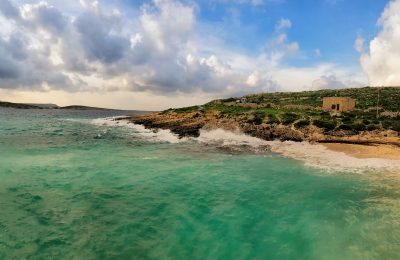 Since the WSC is also responsible for Malta’s wastewater, the company also has the same facilities in this sector too, complete with slope angle and elevation data. Enterprise GIS systems are integrated throughout our organization so that a large number of users can manage, share, and use spatial data and related information to address a variety of needs such as the creation, modification, visualization, analysis, and dissemination of data. GIS benefits organizations of all sizes, and in almost every industry, because it allows strategic operators to visualize, question, analyse, and interpret data to understand relationships, patterns, and trends. There is a growing interest in and awareness of the economic and strategic value of GIS. Proper planning is the most important investment any organization can make in building a GIS. Understanding your GIS needs, selecting the right technology at the right time and establishing documented implementation milestones to measure your progress can ensure your success. In order to fully benefit from this solution and maximize our return on investment, a long-term strategic plan was needed. Here are some examples of critical business functions where GIS plays a major role at the WSC. Within our customer care department incoming reports are pinpointed directly on maps complete with accurate and fast search facilities. The objective of this newly introduced facility, is for so-called notifications i.e. reported technical issues, to be entered through a GIS application to SAP ERP, which is our standard information system. SAP ERP integrates the key business functions of the Corporation; which are mainly asset management, supply chain management, finance and accounting. Notifications are then automatically communicated to the relevant region and the officer in-charge of works. The system has a number of features that would not be possible without a GIS. For example, searching for streets and locations, especially when reports are coming in over the phone, is certainly much simpler and visually verifiable. Switching between orthographic and street map views enables our call centre personnel to confirm a reported location visually by giving back to the reporter on the other side of the line visual cues. 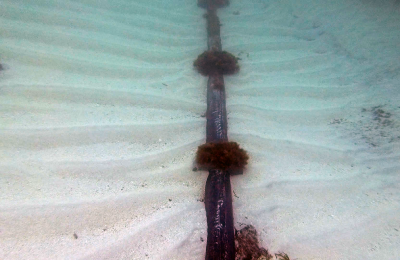 The AquaDot AMM solution has become the main monitoring tool being used at operational level. 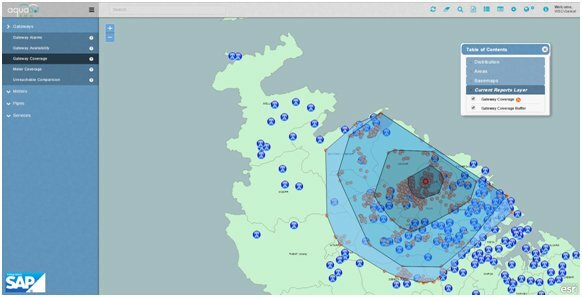 To achieve this effective monitoring level, feature and geometry map services published through internal ArcGIS servers were used to monitor smart meter system components namely RF receiver gateways and meter module transmitters. Through visual aids users can rapidly identify the spatial location of,for example,a particular RF receiver gateway alarm. Users can also spatially locate meter-transmitter issues such as a meter-to-transmitter wire cut, tampering and low battery. The AMM AquaDot solution also incorporates GIS in order to effectively monitor the radio reception between meter transmitters and receivers. By making use of appropriate geometry services, the reception area for every transmitter is stored and periodically analysed for any negative variations. Such variations are very often the result of antenna problems which give rise to requests for repairs. Stored reception area data in terms of metres squaredis also providing information about overlapping reception areas. 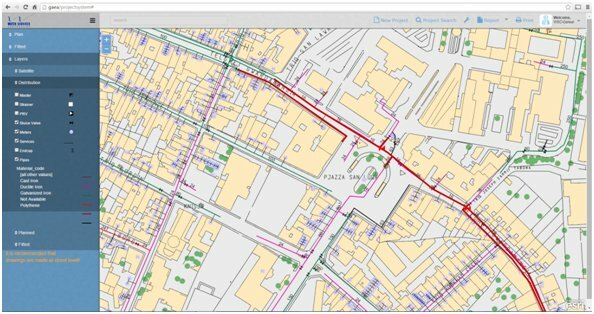 With the use of GIS these overlaps can be identified and analysed for possible removal of redundant antennas which are very costly to maintain. The AquaDot AMM solution can also provide users with information on which gateways have serviced a specific consumer meter over a period of time. 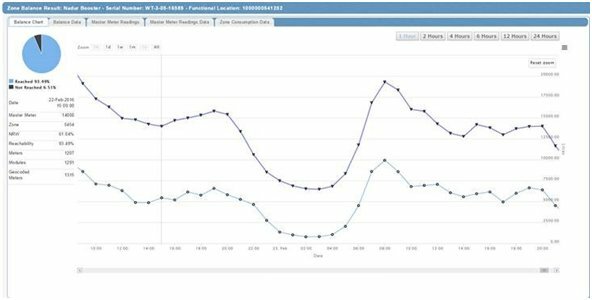 Alternatively, users can specifically select a particular antenna to visually analyse which meters have been serviced within a specified time period. The GIS functionality within the AquaDot AMM solution also caters for the administration of meter-transmitter installation and maintenance management. Personnel can locate meters which require either a transmitter installation or an inspection. The planning of installations and maintenance has really been made easier. One of the main functions of the water services corporation is to undertake projects to maintain and extend the distribution and sewerage pipe network. The AquaDot projects system is a GIS centric in-house developed solution to manage these projects throughout their life cycle. Any planned project is system initialised through asset geo-coding mainly pipes and other fittings. Consequently any attributes related to pipes and other assets such as pipe diameters and material types are stored with every geo-coded feature. 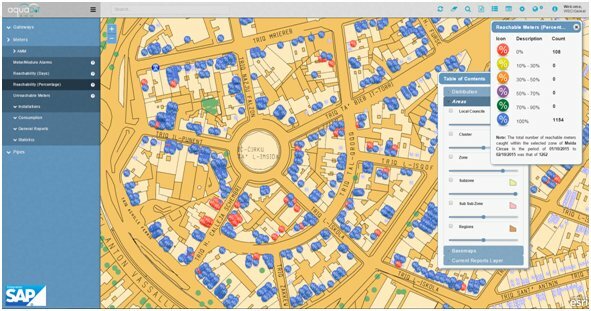 The GIS element within this solution has after a year of use proved to be extremely useful. First and foremost it has become easy to locate the concentration of projects through heat maps. Moreover, as all projects are now being geo-coded, various benefits provided by ArcMap tools are now being reaped. Amongst others, calculations of project pipe length, new service points and their costs, in the context of project locations can be carried out much more efficiently. 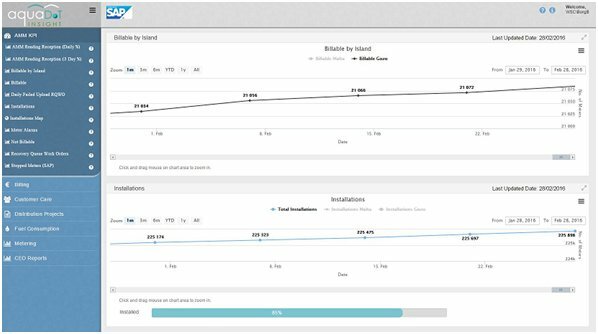 AquaDot Insight is a business intelligence (BI)solution which provides high-level management reports and KPIs generated from data gathered by various solutions. 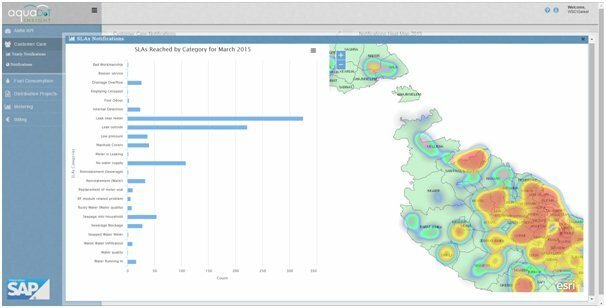 Through the use of user-friendly dashboards, managers can easily and effectively make fast decisions and evaluate trends. The GIS factor has been significantly integrated in order to provide relevant geographic information. For example a specific dashboard provides managers with a visual display of a consumer meter transmitter installation percentage for every locality. Another dashboard provides heat maps showing customer notification concentrations by notification types. Furthermore, spatial analysis is also being applied by generating heat maps based on the type of customer notification and their pre-determined service level agreement (SLA). It is also being carried out to provide information about WSC projects through appropriate heat maps.